Russell or Kororareka in the Bay of Islands has one of the longest histories in New Zealand, with whalers, sealers and other visitors before 1840 for its infamous grog shops. Captain Hobson bought land nearby for his capital. When the capital was moved to Auckland, Hone Heke and his warriors burned down and destroyed Kororareka in 1845, the settlement was abandoned, but it was rebuilt later and renamed Russell. 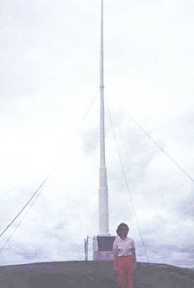 Photo number 4 on this page shows Hui Chin and the Russell flagpole. As a protest against the British and the government, for shifting the capital to Auckland, Hone Heke, a Ngapuhi chief cut down that flagpole four times. Russell, Bay of Islands, New Zealand. Russell, formerly known as Kororareka, was the first permanent European settlement and sea port in New Zealand. 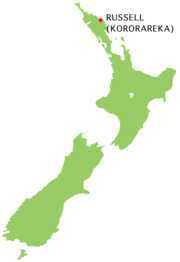 It is situated in the Bay of Islands, in the far north of the North Island. As at the 2006 census it had a resident population of 816, an increase of 12 from 2001. Much of the accommodation in the area consists of holiday homes or tourist accommodation. When European and American ships began visiting New Zealand in the early 1800s the indigenous Maori quickly recognised there were great advantages in trading with these strangers, who they called tauiwi. The Bay of Islands offered a safe anchorage and had a high Maori population. To attract ships, Maori began to supply food and timber. What Maori wanted were respect, plus firearms, alcohol, and other goods of European manufacture. Kororareka developed as a result of this trade but soon earned a very bad reputation, a community without laws and full of prostitution, and became known as the "Hell Hole of the Pacific". European law had no influence and Maori law was seldom enforced within the town's area. On 30 January 1840 at the Christ Church, Governor Hobson read his Proclamations (which were the beginnings of the Treaty of Waitangi) in the presence of a number of settlers and the Maori chief, Moka Te Kainga-mataa. A document confirming what had happened was signed at this time by around forty witnesses; including Moka [the only Maori signatory]. The following week, the Treaty proceedings would move across to the Western side of the bay to Waitangi. By this time, Kororareka was an important mercantile centre and served as a vital resupply port for whaling and sealing operations. When the Colony of New Zealand was founded in that year, Hobson was reluctant to choose Kororareka as his capital, due to its bad reputation. Instead he purchased land at Okiato, situated nine kilometres to the south, and renamed it Russell in honour of the Secretary of State for the Colonies, Lord John Russell. A year later the capital was moved to Auckland on the orders of the Australian-based British colonial authorities. In 1841-2, Jean Baptiste Pompallier established a Roman Catholic Mission in Russell, which contained a printing press for the production of Maori-language religious texts. His building, known as Pompallier Mission, remains in the care of the New Zealand Historic Places Trust. At the beginning of the Flagstaff War in 1845 (touched off by the repeated felling and re-erection of the symbol of British Sovereignty on Flagstaff Hill above the town), the town of Kororareka / Russell was sacked by Hone Heke, after diversionary raids drew away the British defenders. The flagstaff was felled for the fourth time, and the inhabitants fled aboard British ships, which then shelled and destroyed most of the houses. Kororareka was part of the Port of Russell and after Russell (Okiato) became virtually deserted, Kororareka gradually became known as Russell also. In January 1844 Governor Robert FitzRoy officially designated Kororareka as part of the township of Russell. Today the name Russell applies only to Kororareka while the former capital is known either by its original name of Okiato or as Old Russell. Russell is now mostly a "bastion of cafés, gift shops and B&Bs". Pompallier Mission, the historic printery / tannery / storehouse of the early missionaries, can also boast to be the oldest surviving industrial building in New Zealand, while the town also holds Christ Church, the country's oldest surviving church. The surrounding area also contains many expensive holiday homes, as well as New Zealand's most expensive rental accommodation, the Eagles Nest. A car ferry across the Bay of Islands runs between Okiato and Opua, and is the main tourist access to Russell. There is a land connection, but this requires a substantial detour. Russell School is a coeducational full primary (years 1-8) school with a decile rating of 6 and a roll of 115. The school opened in 1892. This page was retrieved and condensed from (http://en.wikipedia.org/wiki/Russell) see Wikipedia, the free encyclopedia, January 2009.